« Pelvic and abdominal pain: What kind of treatments help? 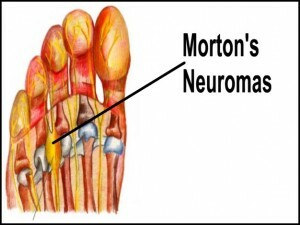 Morton’s Neuroma–why does it happen, what muscles out of sync? On our website, Comstockpt.com and MusclesInSync.com, you’ll notice a tab which is called Muscles InSync (TM). It describes muscles getting out of sync with injury, and how we look to get the timing and coordination of the muscles working well again to get you better. How does this idea relate to Morton’s Neuroma? And….how can it help you if you have Morton’s neuroma? First, what is Morton’s Neuroma? 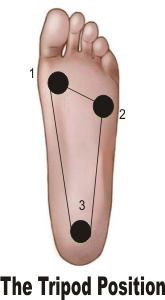 It is tangle of nerves which bunch up between the bones on the bottom of the ball of the foot. It causes a lot of pain when you walk and put pressure on the ball of the foot when you walk. It is a lot worse when you wear high heel shoes or heeled boots. Which muscles are out of sync if you have a poor foot tripod? In the foot, the adductor halluces muscle, transverse portion (runs under the ball of the foot) supports the piece of the tripod which runs from the big toe to the little toe. Try these two exercises slowly for 2 weeks and see if you can achieve a good tripod!